This week, a song that tips the hat to the original and best Nick Fury, from Marvel's Sergeant Fury and his Howling Commandos. All sung/howled in a scatty, raspy delivery, suiting the pre-Joe Quesada's no smoking rule, cigar chomping version of the hero. Interesting song, and interesting band find there Dan. Never heard of me until now, but based off first impressions, they seem like oddball acts, like Arthur Brown and Taco. Huh. Big band and sort of rock huh? I guess Nick might appreciate the shout out, but he wouldn't dig the music or the band. Probably call them a bunch of sissies...and that's the clean version. Yeah there are definitely some far flung corners of the Comics Beat library, but I wanted to go to some before the christmas editions roll round and that mainstream Christmas / New Year pop takes centre stage. You know, balance out the flavours a little bit. Me, I'm just glad Nick Fury has one. 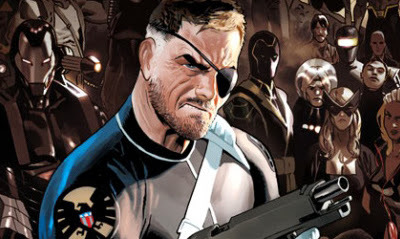 If it was left to me it'd be something like (hits play on the keyboard's Salsa beat) "Nick Fury sees a little blurry, lives in a town called Dury, with a wife who's Furry, and to evil he's judge, executioner and jury" so i think we can be thankful that's not the case. SAHB have a cult followng worldwide. Alex's oldest son (also Alex Harvey) who trained as an actor, has been a close friend of mine for over twenty years. Alex Harvey Snr. also wrote a song for Frazer Hines of 60s Doctor Who fame. It was called " Jamie's Awa' in a Time Machine. Hey Dougie - thanks for sharing that and helping fill in the great backstory! I have to admit even I was surprised when I Googled to make sure I had the lyric's right word for word, and hadn't heard anything wrong, the amount of website references to them from all over the globe was really great to see.